The House speaker writes to the president after he says he planned to deliver his speech next week despite her request to postpone it. WASHINGTON — House Speaker Nancy Pelosi on Wednesday rescinded her invitation to President Trump to deliver the State of the Union in the House next week – denying him a national platform for the annual speech in an extraordinary standoff between the two most powerful figures in the nation. The cancellation – part of an escalating and at times personal feud between the newly elected Democratic speaker and the Republican president – illustrates the extent of the dysfunction that has gripped Washington and America’s body politic amid the longest federal government shutdown in U.S. history. “We’re supposed to be doing it, and now Nancy Pelosi – or ‘Nancy,’ as I call her – she doesn’t want to hear the truth. And she doesn’t want, more importantly, the American people to hear the truth,” Trump said at a meeting with conservative leaders at the White House. One similar parallel was in 1986, when President Reagan asked Speaker Tip O’Neill for permission to deliver a speech lobbying lawmakers on aid for contra rebels in Nicaragua in advance of a closely-watched vote. But O’Neill turned down the president’s request, which was not for a State of the Union. In her letter to Trump on Wednesday, Pelosi said the president can give the annual speech at the Capitol once the government shutdown is over. When she extended Trump the invitation earlier this month on Jan. 3, “there was no thought that the government would still be shut down,” Pelosi wrote. Pelosi’s letter came just a few hours after Trump had informed her that he planned to show up at the Capitol on Jan. 29 to deliver his annual speech to Congress. Shortly before Pelosi released her letter, House Minority Leader Kevin McCarthy, R-Calif., released a resolution that would permit the president to deliver his address. But Pelosi’s statement means that the measure stands little chance of being taken up by the Democratic-led House. It’s unclear how Trump will deliver remarks, if not in the House. The administration has planned possibilities both in Washington and elsewhere nationwide, and Trump has received overtures from state officials in West Virginia, North Carolina and Michigan to give the State of the Union there. In the private meeting with conservative leaders, Trump remarked that Pelosi’s decision to disinvite him from the House chamber was a disgrace, and that it was bad for the country, according to Mark Krikorian, the executive director for the Center for Immigration Studies who was in attendance. Krikorian said he suggested to the president that he deliver the speech from the border, although administration officials in the meeting only indicated they would have an announcement about Trump’s State of the Union plans at some point. Pelosi had sent a letter to Trump on Jan. 3 inviting him to deliver his annual address at the Capitol. 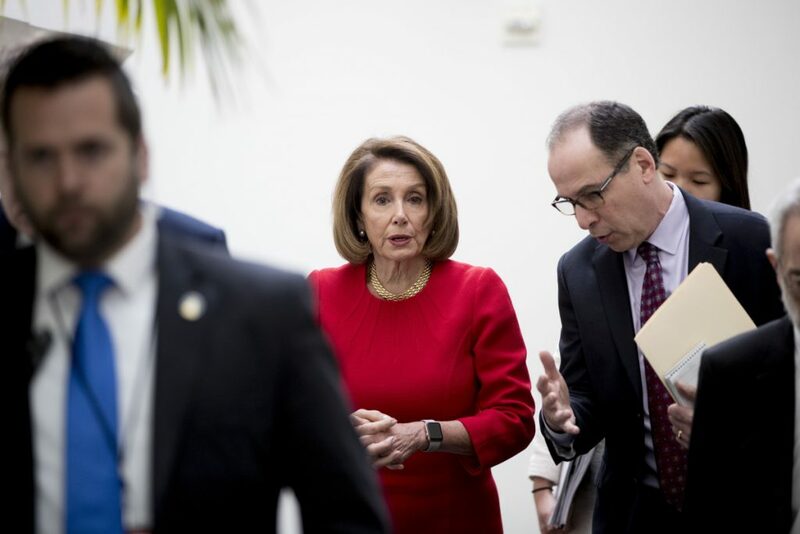 But with Democrats and the White House at an impasse over Trump’s border wall, Pelosi wrote to Trump again last week urging him to delay the speech, or deliver it in writing. In an exchange with reporters Wednesday morning, White House press secretary Sarah Sanders said the Secret Service and the Department of Homeland Security had “satisfied” the safety concerns raised by Pelosi, without giving further details.